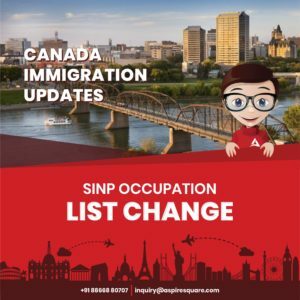 SINP updates its occupation in demand list, and with this update now only 7 occupations are eligible to go ahead without licensing requirement from total of 33 eligible occupations. Being Best Migration Agent in Gujarat, you can trust on Aspire Square for your immigration process of Canada. We are here to help you in strongest possible way. We are specialized consultant in Canada Immigration with handful experience on Express Entry program and Province Nomination Program. Following are key features of the SINP. This sub-category is aligned with the Federal Express Entry program. Candidates in this sub-category need to meet the eligibility requirements to enter the Express Entry pool. No job offer is required for this category. Applications are received on a first-come, first -served basis from eligible candidates in the Express Entry pool. If candidates obtain successful nomination from SINP, can get an additional 600 points under CRS for Express Entry program. Applicants need to score minimum 60 points form 100 on the SINP point system. Applicant must have a minimum level of work experience closely related to field of study or training in a Nominated occupation (NOC – 0, A, or B) form the occupation demand list of SINP program. This program is outside of Express Entry. Applications are process on first-come, first-served bases and outside of Express Entry program. Applicants must meet the minimum one-year of paid experience requirement in last ten years relevant to their field of education or training in a skilled occupation (NOC – 0, A or B) from the occupation demand list of SINP. New occupation in demand list consist total 33 occupations. Now from these 33 occupations only 7 occupations do not require to meet specific licence requirement. Rest 26 occupation require to meet professional licence criteria from the relevant organization designated by Saskatchewan government. In many cases, licencing process can be completed form outside Canada. 7 Occupation that do not require to meet license requirement. 26 occupations that need to meet professional license requirement. Being leading Immigration consultant for Canada in Gujarat, we would like to give you accurate and transparent advice for your eligibility for Canada Immigration process.